My husband was lying in the hospital bed, dying. It wasn’t as if I should be surprised—he had been in and out of hospitals many times that year, suffering from complications of multiple sclerosis. Yet, I was. I was in shock. I had been his caregiver for the last ten years, and now, at the time of his death on January 1, 2006, I couldn’t stop. I still had to take care of him. Less than a minute after he drew his last breath, I began reading a Tibetan Phowa, or prayer, to Amatabha Buddha to guide Michael’s transition. It was a long and beautiful poem that guided him as he experienced the stages of death and the many levels of transition. Amitabha is a Sanskrit word that literally means boundless light and boundless life. He is the Buddha in the Land of Ultimate Bliss (Pure Land), in which all beings enjoy unbounded happiness. He can provide a “short cut” to enlightenment. By reading this phowa, I felt still connected to Michael, still able to care for him. 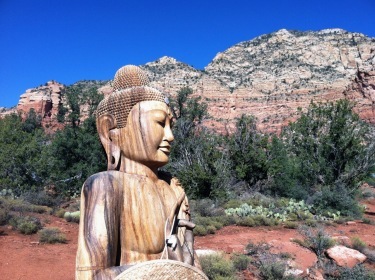 Nearly six years after my husband’s death, I hardly expected to meet Amatabha Buddha again in Sedona, Arizona, and this was not the only surprising thing that happened there. It was my first time in Sedona, and I immediately felt a resonance with the red rock monuments that surrounded the city, the fresh, pure air, and the inexplicable otherworldliness of the place. A bit skeptical about the fabled vortex sites, I decided to experience one on my own. The most accessible was just off a road that ended at the city’s small airport, conveniently called Airport Vortex. I parked my rental car and followed a red earthen trail that led me up and around an area between two red peaks. Below was a view of the green dotted valley with more red rock cliffs in the distance. After following the trail a short way, I sat down just off the path and began to meditate, opening myself to my surroundings. After a few moments, I was surprised to feel a tug at my heart and a deep and sensory connection to the energy emanating around me. I sat transfixed until the persistent pull began to overwhelm me, and I reluctantly got up and followed the trail back to my car. For me, the vortex energy was real. 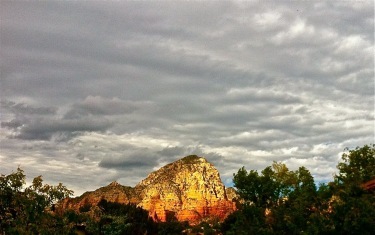 And it wasn’t only when near a vortex that I felt the magic pull of Sedona. For most of my stay, I was mesmerized by the vividly blue sky that offset the towering rocks, with their strata of rusty red—caused by the presence of oxidized iron—and their lighter strata of pale limestone. When it rained, the dark clouds changed the sky into dramatic silver gray, and, as sunlight broke through, it cast a golden light on the rock formations. I was mesmerized by the drama of the scene constantly changing before my eyes as the play of light and dark unfolded. In my hotel room one day, when the prevailing sunshine again transformed my surroundings with clear blue skies and puffy white clouds, I discovered a postcard for an Amatabha Buddha Stupa, or spiritual monument. It was only a short distance away. The local Tibetan Buddhist community, I read, had built this Stupa as a special sanctuary in a red rock area west of the historic uptown. I had to go there. As I hiked up the short trail from my car to the Stupa, I was excited to discover what I would find there. Suddenly, rounding a bend, I came across a large, tall red structure with a sculpture of Amatabha Buddha encased near its top. I was the only one there, and I followed the posted suggestion to walk three times clockwise around the Stupa. As I did so, I prayed for Michael’s and my own continuing growth and happiness and happiness for all sentient beings. I felt a strong connection to Michael and to the serene beauty of this special place. Later, as I sat in meditation, it came to me that I must travel to Tibet. Not really overjoyed by the prospect of such a long journey, I nevertheless knew that one day I would make this pilgrimage. The Buddha was still with me when I went on a Pink Jeep tour to the canyon lands and the site of Palatki ruins. (Pink Jeep tours start from the historic uptown section of Sedona and take visitors to an array of off-road destinations.) 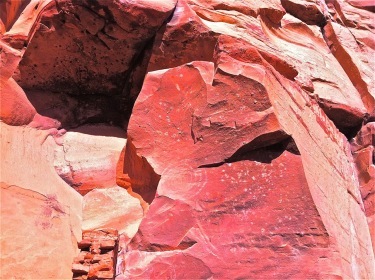 Ancient Native American cliff dwellers built homes in the red rocks and inscribed them with their mysterious petroglyphs. They lived in the area from 900 to 1,000 years ago, until the 1300s when they disappeared. I appreciated our guide’s knowledge of the area—for instance, he spoke of the Spanish explorers who arrived about 1583 in search of silver and gold. They named these vanished native peoples the Sinaquans, which means “without water.” Indeed, water was a precious commodity, and they were extremely resourceful, using urine for liquid and feces for glue in the preparation of their red bricks and mortar. Our guide also pointed out many petroglyphs that I would not have noticed had he not told me where to look. Among the marking was one that stood out for me above all others: a spiral drawn in white. The spiral—considered by many as a symbol of the cycles of life—reminded me of Amatabha Buddha, the circles I had made around his Stupa, and the spiral of life and death that was honored in the phowa I had read at Michael’s passing. I felt a sudden connection to this ancient community of people who worked so hard to live and thrive in this arid and beautiful setting. When it came time to go home, I left Sedona reluctantly. It had been a place of surprising synchronicity for me, a reminder of the sacred cycle of life and death. I found connections to ancient peoples, energies and sacred traditions that renewed my desire to live more respectfully in the world, conscious of the transitory nature of life and beauty and the universality of human experience. If you enjoy the articles on YourLifeIsATrip.com, please visit another great resource and one of our sponsors, Prague-Stay.com, offering exclusive Prague accommodations, serviced apartments, holiday rentals, hotels.